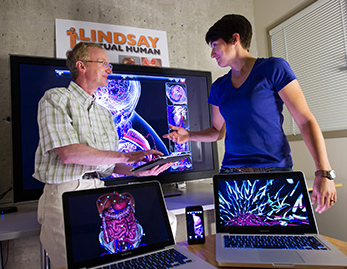 In July 2013, UToday announced the release of our first app, the Zygote 3D Anatomy Atlas and Dissection Lab, which is available to the public on the Apple iTunes Store. A detailed description of this app, its features and short tutorials can be found on Zygote’s Atlas web site. As of September 2013, all students, faculty and staff at the University of Calgary can download this app for free on their iPhones or iPads. Lindsay Anatomy App for iOS: download from this site. In addition, the LINDSAY site offers a web-based 3D anatomy atlas and exploration tool, which allows to build and customize virtual specimens and save these under your own account. LINDSAY Anatomy Atlas on the Web: download from here. LINDSAY Anatomy Specimens: a collection of virtual 3D specimens of human anatomy. Download from lindsay.ucalgary.ca. For any questions and comments regarding the updates and a download link, please contact Christian Jacob (cjacob@ucalgary.ca)!